Yesterday morning we left The Isles Inn in Portree, where I was pleased to see two lovely lighthouse decorations in the room – very apt! Our main focus for the morning was to reach Neist Point, the most westerly point of Skye. It was a nice drive there with some more fantastic views of the hills, particularly MacLeod’s Tables with their surprisingly flat summits. There were some long and windy roads and, although I didn’t recall the roads from my first visit to Neist Point when I’d failed to see the lighthouse, I remember how long it took to get there – Skye’s not a small island! Once we’d reached the end of the road we parked up in the car park and set off, lighthouse-bound. It was a very picturesque stroll to the lighthouse, passing the old hoists they would have used to move things up and down from the lighthouse. The coastline around Neist Point is beautiful with impressively high cliffs. When we reached the lighthouse I was a little saddened to see that many of the buildings there appear to have been left to fall into disrepair. The lighthouse cabin had definitely seen better days and the walls of the keepers’ cottages could have done with at least a lick of paint. They advertise self-catering accommodation there and it looks like they are rarely taken up on the offer. I imagine walking about a kilometre/over half a mile with a large amount of downhill and lots of steps, with suitcases or shopping bags may not appeal to everyone! The tower itself and attached building looked well-kept though and there were some great views across towards North and South Uist. We may have been able to spot a bit of South Harris too. At one point we were looking over the sea and I said ‘hello seals, are you there?’ hoping to catch site of one in the sea and then Bob noticed a couple of heads bobbing around in the sea – these were in fact seal heads! Leaving Neist Point lighthouse behind, I felt sad that it wasn’t being looked after better. I suppose, being so remote, that’s just the way things go sometimes. We got back to the car and set off towards the north of the island, passing through Uig and then heading inland across the Trotternish towards Staffin. 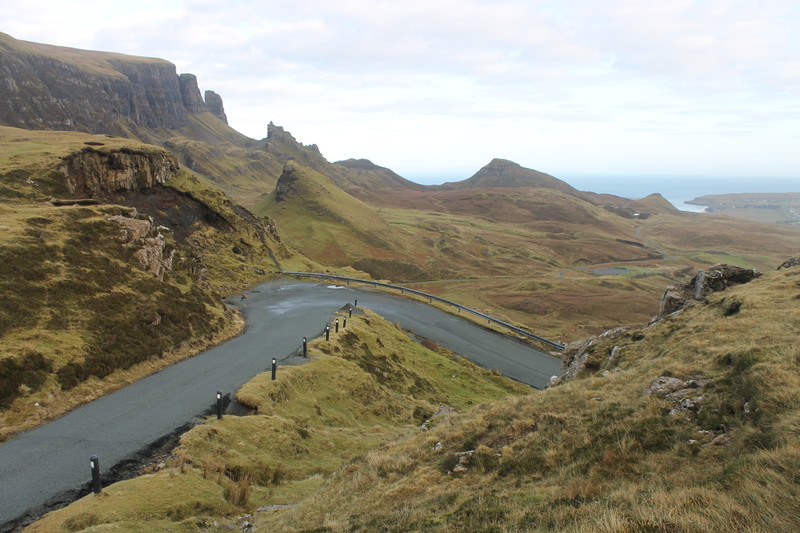 I was enjoying the views anyway, but then we reached the Quiraing and I was astounded. The magnificent scenery was created by a number of landslips in the area. In every direction we looked it was stunning and we could even see over to the snow-capped mountains of Torridon on the mainland. The road winding through the hills here gives you constantly changing views of the area. A short while after re-joining the main coastal road we stopped at Kilt Rock, where there are incredible views across to the rock itself and the nearby waterfall. From here we were also able to see across to South Rona and caught a glimpse of its lighthouse. The Torridon hills looked even more fantastic from here. Bob was keen to take me up to see the Old Man of Storr, a 46 metre high (apparently 11 double-decker buses on top of each other, if that helps) pinnacle of rock which formed from glaciers during the Ice Age. 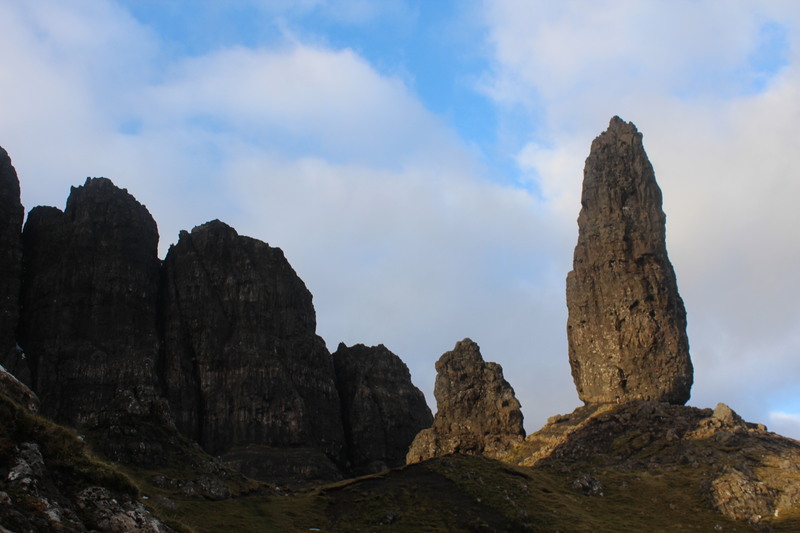 It sits below the high cliffs of The Storr, the highest point in the Trotternish Range. It’s about 530 metres above sea level and when I asked Bob what walking up to it could be likened to that I’ve already done, he said it was like walking back up from the Mull of Kintyre lighthouse. 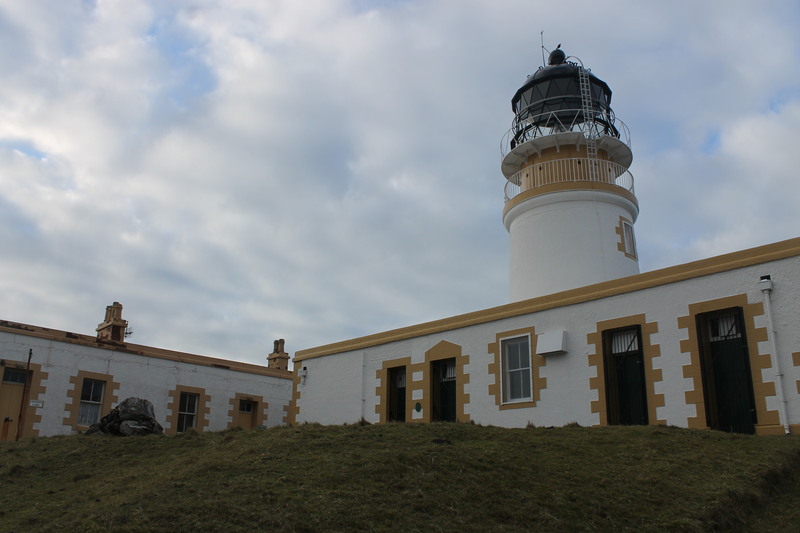 On hearing that and remembering that I’d managed to get back from the lighthouse (with a lot of help from Irn Bru) I thought we might as well give it a go. At the time I thought Bob had already been up to it, but it turned out that he hadn’t, which made me even more glad that I’d agreed to it. Having looked at the maps of the area we were both expecting to be traipsing up through a forested area for the first section, but this was not to be. There has been a great deal of deforestation in the area, so much so that there are no longer any trees left. So, instead we traipsed up over bits of tree branches and leaves instead! As we got further up it became tougher and I slowed down quite a bit, but I still kept going and we managed to get quite close to it just as the sun was beginning to go down so we had some fantastic light on this amazing rock with the dark cliffs in the background. We finally reached the Old Man and enjoyed the amazing views from all around, just beautiful and we had the rock to ourselves during the time we were up there. Strolling back down at a faster pace, we stopped occasionally to enjoy the views and take some pictures of the Stornoway coastguard helicopter as it flew overhead. It was then time to start heading home and Bob decided to take me a different route this time so I could see for myself the seven mountains in a row he’d climbed in one day before cycling (mostly uphill) all the way back to the start. Crazy! We also briefly paused for a look at Eilean Donan Castle as well as Urquhart Castle, which were both lit up beautifully in the dark. We stopped off for dinner in Inverness and arrived back at our beautiful home to see the moon lighting up the North Sea.